This post will take some twists and turns, but hopefully we’ll pass some points of interest for each reader along the way (all 3 of you). We visited our friend, Joan, who was our next-door neighbor when we lived in the village of Sedgwick way back in ’93. She owns one of the oldest, if not the oldest, homes in town. She was getting her wheel all ready for a spinning demonstration at the Blue Hill Fair. It seemed very appropriate to watch her at work in the parlor of the home, near the great brick fireplace and original paneling. 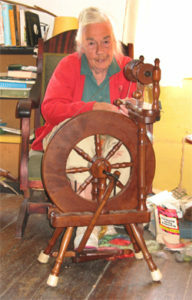 Joan also spins for one of my favorite artisans and former customers, Betsy Coakley of Mermaid Woolens fame. She designs some of the most beautiful sweaters I’ve ever seen. If you are a fan of woolen wearables, you simply must visit her site. 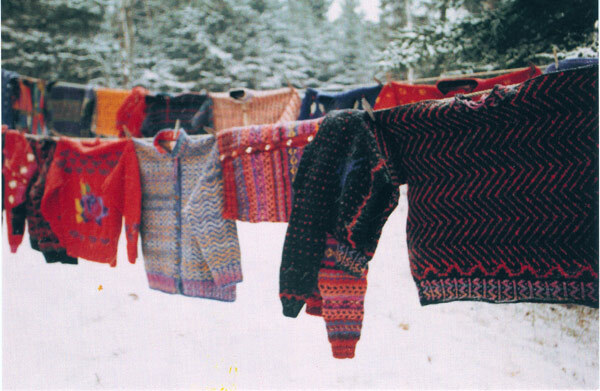 I love this photo of a selection of her past designs — I think the backdrop of fallen snow make the warm, vibrant colors sort of leap out at you. She also paints stair treads and does a dozen other cool things. Be sure to read her bio, when you visit. Now, speaking of the Blue Hill Fair, you probably remember it as the setting of the children’s story, Charlotte’s Web. Well, Charlotte’s Web was written by E.B. White, who lived in neighboring Brooklin Maine. Mr. White had two housekeepers, who I knew; Ethel and Tink. Denise and I became good friends of Ethel’s, so when we visit Maine we like to stay in the apartment above her garage. Sometime I’ll tell you about the wonderful conversations I used to have with Ethel and the stories she would tell. She is one of the sweetest people I’ve ever met! She grew up over to Brooksville. Now, Brooksville is on the other side of Sedgwick from Brooklin and, when you go there you will want to visit Buck’s Harbor, where you will find Condon’s Garage. That establishment figures prominently in Robert McCloskey’s One Morning in Maine. I think we have most of his books and my favorite is Blueberries for Sal. I have to admit that I enjoy his drawings even more than the stories themselves. Denise and I read that the garage was closing down and I think we saw it come up for sale in the multiple listings a year or so ago. Mr. McCloskey died in his home on Deer Isle not too long ago. 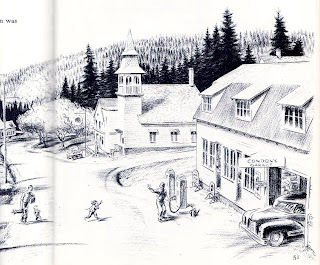 Deer Isle was the home of famous primitive folk artist, George Hardy. One of our favorite documentaries of all time is Portrait of George Hardy by Gabriel Coakley (sound familiar?). Gabe won the Cine Golden Eagle Award at the US Super-8 Video Festival in 1995 and let me tell you – I’ve never seen anything that captures winter on the Eggemoggin Reach like that film, with the sped up sequences of wind blowing sea smoke across the chilly waters and Mr. Hardy bustin’ up the ice on his stoop, so he can get his door open. I’ve missed so much! I love seeing your friend with her castle wheel! We/I/Sam especially love(s) E.B.White! I cannot take this all in at once. I’ll be back. What lovely sweaters! I cannot click to enlarge! great read bo..I’m sure there are at least five of us out there! This is the kind of thing and adveristing from a Maine I do not recognize and find frankly abhorant. Its like dressing up a donkey. Any one who reads and sees these photos ad journal are happy with the veneer, putting onto reality an outsiders’ gloss and fring that to me never was and I hope never will be. But of course those who have the money and power to make Maine more of a voyueur’s preserve will drive this native Mainer away. It is a shame. My cold comfort is that the so-called “lovers of Maine” will turn it into the same place they left and become disillusioned. Richard, what is the Maine you recognize? We may see eye to eye on more than you think, but when I wrote this three years ago, I was brining out points that others from away would recognize or connect with… When we moved to Maine in ’93, I knew practically nothing about the place… we “parachuted in” at a time when there was no worldwide web… I’m not one of the moneyed people. In fact, it was in Maine for the first time in my life that I was not only treated like, but was told I was “one of the little people” that made Maine a quaint place to vacation… the wife of a state attorney general from away told me that to my face. Anyways, Maine is an interesting and unique place, like the town I live in now. We get the same folks, who move here and want to change everything. I moved here, because I liked it the way it is/was and I didn’t fit in where I grew up. Same is true of Maine. I got tired of the people from MA or NY, who went to camp in Maine when they were kids and thought it was heaven… they were a real pain. I also saw the “Delores Claiborne” side of Maine, which was hard to take… but those are stereotypes that I reject, as well. Are you a Deer Isle Eaton?